Repentance is a churchy word that's seldom heard or understood out in the world. In Jonah 3, we find repentance in the most unlikely of places. 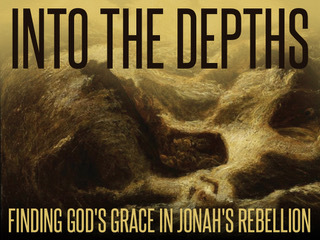 I invite you to listen to this last Sunday's sermon from Jonah 3 as we encounter a God who does not follow formulas, who uses people for his purposes despite their dispositions, and who overturns our hearts with his overwhelming grace. 1 Then the word of the Lord came to Jonah the second time, saying, 2 “Arise, go to Nineveh, that great city, and call out against it the message that I tell you.” 3 So Jonah arose and went to Nineveh, according to the word of the Lord. Now Nineveh was an exceedingly great city, three days' journey in breadth. 4 Jonah began to go into the city, going a day's journey. And he called out, “Yet forty days, and Nineveh shall be overthrown!” 5 And the people of Nineveh believed God. They called for a fast and put on sackcloth, from the greatest of them to the least of them. 1. What is the significance of God sending his word to Jonah a second time? Why didn’t he just use someone else who was more effective? What does this tell us about God? What does it tell us about ourselves? 2. What does God’s special recognition of Nineveh (see v.3a, “Nineveh was a great city to God”) tell us about his heart for the nations? What are some unexpected places we know of (both near and far) that might need to hear the gospel? What are some barriers that keep us from taking the gospel there? 3. God used the story of Nineveh’s repentance to highlight Jonah’s (and by extension Israel’s) unrepentance heart. What are some ways God’s grace to others has an effect on our own hearts? 4. How does Jonah 3 show that the word of God is more powerful than our hearts? What are some examples you’ve seen of the power of the word of God on people? 6. What does true repentance include? Are the Ninevites good examples of true repentance? What does it mean that repentance needs a direction? Compare Nineveh’s repentance with that of Ahab in 1 Kings 21:17-29. 7. Compare and contrast Jonah with the king of Nineveh. What aspects of repentance does Nineveh’s king exhibit that Jonah doesn’t? 8. In what ways does God’s grace overturn us?